2014 : Exhibition in Paris, Singapore. 2013 : Exhibition in Perth, Fremantle, Mandurah - Australia. 2011 : Exhibition in Florence - Italy, Paris - France. 2010 : Exhibition in Paris. 2009 : Exhibition in Salon d’Automne International in Luneville, France. "Dzung often creates in a definite subject, for example : human fate in the face of nature, buffalo fate and he is now creating a subject that I order him to paint lotus and life. According to many prestigious painters in Hanoi, Dzung has the special painting style, the original way in choosing color and he doesn’t hesitate to choose dark colors to express his thinking. 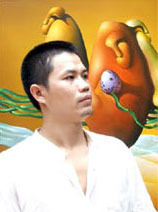 Those are different from others Vietnamese painter who have used to bright and brilliant colors. Thing that makes us be interested in Dzung’s paintings is the bright color dotting in a whole painting. For example : the red and green strings to tie buffalos, the green grassplots…" Xuan Phuong, Lotus Gallery, Saigon.